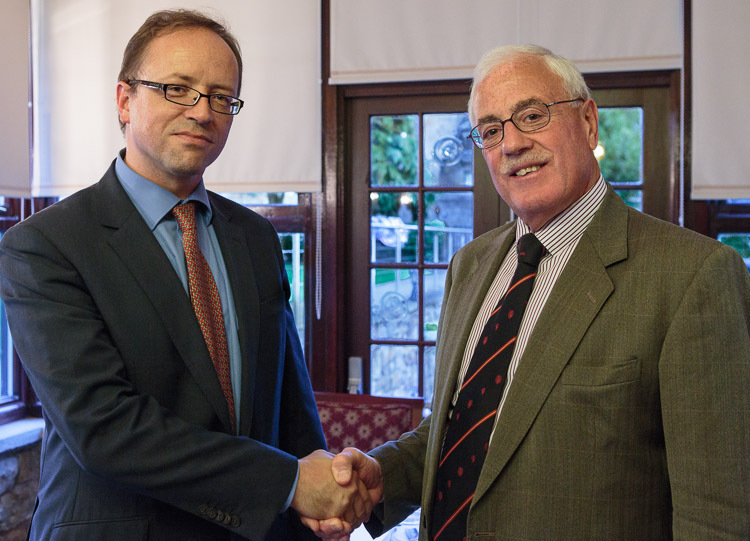 Professor Matthias Klaes, Dean of the School of Business and Professor of History and Philosophy of Economics at Dundee University, used the subject of his talk to the latest meeting of the St Andrews Business Club to amend the format of the meeting. In line with his topic – “Crowdfunding: Disruptive Innovation or Old Wine in New Bottles?” – Professor Klaes first provided intellectual capital to his audience of members of the club and IoD Fife before receiving a dividend in return, in the form of feedback and views in the meeting at the Best Western Scores Hotel, St Andrews. He presented the informal white paper “A Framework for European Crowdfunding” which is a colloborative exercise with other researchers in the EU. It details the origins of the novel web-based funding source, describes its many business models and poses questions about crucial topics such as regulation. It was warmly received by the members, who asked questions on points of detail. Club President and 40-year Fellow of the IoD, Kenneth Russell, gave a vote of thanks before informal networking.